Manutec announces the launch of a new range of 16” press wheels specifically designed to be fitted to the John Deere 1870. Available in four different 16” tyre options, the new wheels are also compatible with all Manutec 15” tyres. The new wheel comes complete with bushes, bearings and seals to allow quick and easy fitment to the JD 1870. 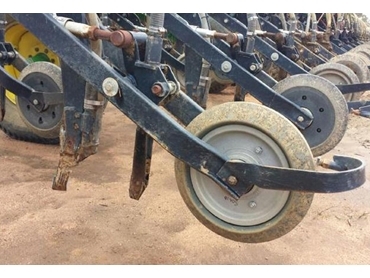 Specifically designed to operate in Australian conditions, the new 16” press wheels also reduce the through-life maintenance costs associated with these types of wheels. Tyre options include both long life and soft-mud versions. Key advantages of the new gauge wheels include long life tyre option, clay mud tyre option, access to low pressure and high pressure tyre options, aluminium rim for reduced weight, and fully sealed bearings with additional external seals. This wheel is also compatible with Conservapak machines. The new press wheels are now available; early ordering is advised due to high demand. The new 21” replacement gang tyres for the John Deere 1820 and 1830 air drills are also now in stock. A complete replacement wheel will be available for the 2014 season. The new 16” Mud Razor gauge wheels to suit the John Deere 1860 and 1890 models are now available. 05/03/2014 - We do a range of tyres that can be used in the Conservapak and JD1870 machines.